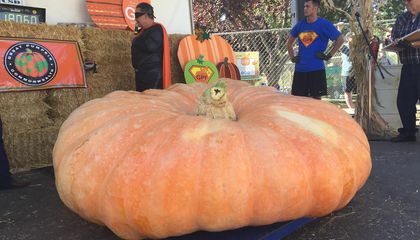 A farmer won a Northern California contest with a record-setting 1,806-pound pumpkin. The judges nicknamed it "The Flying Saucer" because of its wide and flat shape. Tim Mathison was one of about 50 big-pumpkin farmers to haul their heaviest crops to the annual weigh-in at the Elk Grove Giant Pumpkin & Harvest Festival. Most of the pumpkins entered in the Oct. 3 contest were grown in about 90 days. Some grew as fast as 30 pounds per day, said Brian Myers, chairman of the California Pumpkin Growers Association. There were about half as many pumpkins entered this year than in previous years. That was largely due to what farmers said were overly hot and suboptimal growing conditions. According to the Sacramento Bee newspaper, Mathison collected $12,000 in prize money. But he said the most important part of the event was sharing it with his 28-year-old daughter, Tara. She uses a wheelchair and has a neurodevelopmental disorder called Rett syndrome. She was with him almost every night as he tended to his patch, he said. "She knows what it's all about," he said. "It makes her really happy." 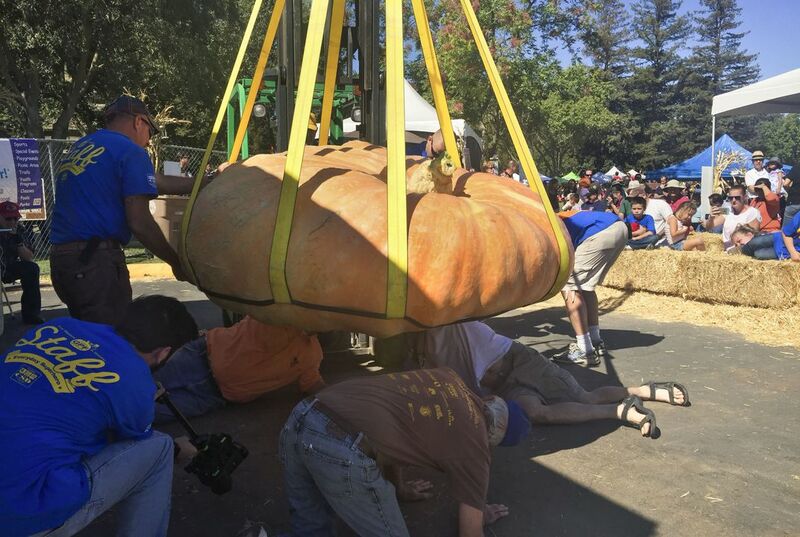 The winning pumpkin beat last year's monster pumpkin, which weighed in at 1,584 pounds. But no one came close to beating the national record for heaviest pumpkin, 2,154 pounds. Tim Mathison , in addition to the prize money, purchased the unique seed from the Make A Wish Foundation and also got to share the winnings with his daughter with Rett syndrome. I found this article interesting and it surprised me that pumpkins can weight 1,000-2,000 pounds!!! Tim Mathison benefits from this not just because of the prize money but because according to the text, "...he said the most important part of the event was sharing it with his 28-year-old daughter, Tara. She uses a wheelchair and has a neurodevelopmental disorder called Rett syndrome. " i found this article interesting because it lets the world know that the world isn't just based on money or winning, but it revolves around family. This article surprised me because I found out that the heaviest pumpkin is 2,154 pounds. Tim Mathison benefited from the contest because he won 12,000 dollars.Also while creating the massive pumpkin he was able to spend time with his daughter who has Rett syndrome while tending to his crop and he bought the seed from a charity.This article was interesting to me because Tim was able to benefit from not just the prize money. He was able to buy the unique seed that he used in the contest,also it was a foundation for charity for kids with life threatening conditions. Wow, I did not know that pumpkins can get that big! That's one colossal pumpkin seriously what did they do to these pumpkins while they were growing, did they inject them with 5 liters of steroids but its sad that the daughter has a nerodevlopment disorder and can't walk. The other benefit is that he gets to spend time with his daughter who has rett syndrome which makes so she can't walk. Tim put his prize money towards his daughter with Rett syndrome. He shared the money with her because she was with him almost every night Tim tended to his pumpkin. The size of this pumpkin is surprisingly large! Its surprising how it came from Northern California because I didn't think they had the best soil.